The Gig-Saver: 15 Tones, One Guitar Using his knowledge of electronics, University of Maryland associate professor Bruce Jacob has developed a new guitar that seamlessly switches among 15 tones. Along with graduate student Joe Gross, the two have started Coil Guitars. The Coil Guitar is the equivalent of an automatic transmission: You get 15 guitar tones in one instrument. Bruce Jacob, an associate professor of electrical and computer engineering at the University of Maryland, had a musical problem. His new electric guitar just wouldn't give him all the sounds he wanted. He used his knowledge of electronics to solve his problem by building his own guitar. Jacob developed an instrument that could be switched back and forth through a range of sounds, all without pedals or add-ons. Along with the help of some his students, including Joe Gross, Jacob turned this guitar into a business. "Joe [Gross] was looking over my shoulder and said, 'You know, a lot of people are gonna want that.' It was an experimental thing, and he made me realize this is actually a product," Jacob says. 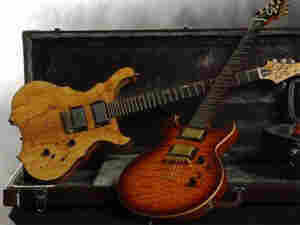 The point of the Coil Guitar is that you get many different tones from one instrument. In an interview with Robert Siegel, Jacob demonstrates the abilities of the Coil Guitar with NPR engineer Brian Jarboe — who, apart from his day job, is a guitarist. Click the audio link on the left to hear the 15 different settings. Jarboe could get these different tones out of a normal electric guitar, but the point of the Coil Guitar is the ease of switching between the tones. There are only two switches on the guitar's body — it's the equivalent of an automatic transmission. Admittedly, the launch of Coil Guitars comes at a point of deep economic recession, but as Siegel suggests, "In these hard times, why go buy five new electric guitars when you can buy one?"